"This castle is a creature of chaos. It may take many incarnations." Castlevania: Symphony of the Night (Dracula X: Nocturne in the Moonlight in Japan) is a PlayStation game released in 1996 (and later re-released in Japan, with extra content, on the Sega Saturn). Symphony of the Night is widely regarded as the highpoint of the Castlevania series: it's responsible for the other half of "Metroidvania", it's the earliest known entry in the series to avert an Excuse Plot (well, first released outside of Japan), and contains a number of oft-repeated lines about the nature of mankind. The game begins with Jack Henry Dappen banishing Dracula in 1792. Four years later, Jack disappears -- and a year afterward, in 1797, he summons Castlevania in an attempt to resurrect the Dark Lord. Jack's dire actions cause Alucard, Dracula's half-vampire son, to awaken from his three hundred year slumber and enter Castlevania to figure out what's going on. During his exploration of Dracula's castle, Alucard is joined in his quest to find Jack by Maria Renard, a distant relative of the Belmont clan. Since Metroid was on hiatus at the time, Symphony introduced a generation of new gamers to an innovative gameplay style: Alucard was free to wander to any point on the map, but had to find specific relics to explore new areas, most of which were guarded by bosses (which forced players to level up to increase Alucard's stats). Alucard could also find equipment to change his attacks or cast spells. Anyone who's played any Castlevania game after this one will likely find this formula familiar -- but back in 1996, this was a Killer App for the PlayStation (whether Sony liked it or not). The Sega Saturn version (released only in Japan) added a number of exclusive areas, new music, and two new bosses -- but it's widely considered inferior to the original (thanks to horrible load times and downgraded graphics). What is a trope? A miserable little pile of secrets! But enough descriptions, have some examples! Anachronism Stew: A lot of the food items are stuff that didn't exist in 1797. And I Must Scream: The fate of the Succubus upon Alucard killing her. "Death in the dream world will set your soul wandering for eternity, demon." Anti-Grinding: The experience you gain depends on the result of [Enemy's Level] minus [Your Level]. Therefore, grinding against the same types of enemies for extended periods of time will yield diminishing returns, forcing you to seek out stronger enemies. However, this can make grinding ridiculously easy, depending on the order you go through certain areas. As the Good Book Says...: Dracula quotes Matthew 16:26 upon his defeat. Ascended Extra: This is the first Castlevania game to use Death as a character, rather than a mere Recurring Boss. Attractive Bent Species: If the Bat familliar is active, a cartoon heart flies out of it and it starts to follow Alucard upon turning himself into one: at higher levels, more bats will join in and they all shoot out a fireball whenever Alucard does in bat form. Award Bait Song: "I Am The Wind", which was unfortunately excised from the PSP remake and the Xbox Live Arcade version (in a later update) due to copyright reasons. They ended up replaced with a new track by Michiru Yamane herself (Mournful Symphony/Nocturne) and the ending song from Castlevania: Lament of Innocence (Admiration of the Clan), respectively. Awesome Yet Practical: the Crissaegrim, once you take the time to get it. It's actually a complete game breaker for the remainder of the journey, especially if you dual-wield a pair of them. Also, the Sword Brothers spell. When the game originally came out, many thought it was Awesome but Impractical because the Sword Familiar can't do the spell until it hits level 90. Nowadays, everyone knows better; while the Sword Familiar needs to be that leveled up to do the spell on its own, you can do it yourself with a button press sequence as long as you have the Sword Familiar and at least 30 MP lying around. Beam Me Up, Scotty: Whenever Dracula's famous question is quoted, the word "little" is commonly forgotten. All of the four endings, two of which are particularly depressing. The two bad ones have the legendary Jack killed off tragically, without letting Alucard be able to see the true mastermind behind all the madness. The other two endings, which are good ones, have Alucard break the curse from Jack successfully, thus saving his life, and they also have Alucard confront the true mastermind, Shaft, as well as Dracula. However, even after preventing the disaster from further poisoning the rest of Europe, Alucard chooses to seal himself again, knowing his blood is cursed with darkness. The Golden Ending is retconned into a Happy Ending by other games, though there are hints in the original that Maria might be able to keep Alucard up at night. Bonus Boss: Galamoth, who is so powerful that in the bestiary, the game doesn't show his HP. Succubus is sort of a Bonus Boss, as she is exclusive to Alucard; If Richter enters the room with the false save point used to access her, there's nothing there except a single Heart. Boss in Mook Clothing: Some of the armors until you level up enough. Cthulhu when you first encounter it at Marble Gallery. Calling Your Attacks: The Demon Familiar. "Fire Spear!" etc. Some of Alucard's spells get in on the action, as well. Which makes it all the more rewarding when you hear Alucard yell out Soul STEAL!!. The Cameo: Konami Man sometimes appears in the File Select screen as a icon. Cape Swish: The sprite animation for Alucard is quite fluid, especially when turning around quickly. Chain-Reaction Destruction: Dracula shows that in action in the intro. Most of the larger enemies and other bosses also meet their fate that way. Chaos Architecture: Alucard explicitly says, "This castle is a creature of Chaos. It may take many incarnations." Chewing the Scenery: Dracula is always acting the hell out of his lines, but he goes above and beyond for the final boss fight. Dracula: Behold my true form, and DESPAAAAAAAAIR! Classical Mythology: Various Public Domain Characters from Greek mythology make appearances, including Scylla, the Minotaur, and Medusa. Continuity Nod: The entire second half of the game. Aside from the villains of Rondo of Blood, Alucard fights the original five bosses of Castlevania (to claim the five body parts from Simon's Quest), copies of the other protagonists from Dracula's Curse, and a more realistic version of the final boss from Kid Dracula. Cute Witch: The cat-slinging witches in the Floating Catacombs. Darker and Edgier: Galamoth. Alucard himself sort of counts, too. Degraded Boss: Several bosses, like Slogra, Gaibon and Karasuman. Demoted to Extra: The Peeping Eye is one of the few enemies from Rondo who does not appear during the game as a fightable enemy, but it sometimes appears as a icon in the File Select screen. However, it does appear in the background, watching you as you trek through the hallway between the Marble Gallery and Outer Wall. Diabolus Ex Machina: In "Rondo of Blood", Jack killed Shaft twice - once in his human form, and once as a ghost. And yet, five years later he's alive and well, and easily takes control of a Belmont (which begs the question of why he didn't do so the first time), something not even Dracula seemed capable of doing! All because they wanted to have White-Haired Pretty Boy Alucard as the hero of the game. He's still a ghost. If you look closely during the dialogue before you fight him, you can see that he's translucent. To confuse things further, the manual refers to that prologue as "Vampire's Kiss", the European title for the SNES adaptation, though technically that's more correct than "Bloodlines". The PSP remake actually changes the last level of Rondo of Blood to "Bloodlines". Would changing the name of the level this way be considered a Retcon? The mercury in the blade of Terminus Est was to shift its balance when striking from above, not to poison the blade. The English manual of the game refers to Maria as "Jack's sister-in-law", despite the fact that Marian was only related to Annette in the SNES version while Symphony is a sequel to the PC Engine version. Granted, it's possible the translator deliberately made that change to reference the version of Dracula X that most people outside Japan were familiar at the time. Did You Just Punch Out Cthulhu? : Yup, and he gave me a Bat Pentagram! FUN FACT: The "Cthulhu" monster was supposed to be the tentacle-faced thing in the inverted castle, but his name got switched around with the demon in the Marble Gallery, which was supposed to be called "Malachi." Difficulty Spike: The Inverted Castle has one when you first get there, which sticks for most of it. New enemies suddenly do significantly more damage and are more annoying placed, as well as the level design being a bit against you at times. The combat knife, which is basically one of those modern, vicious looking knives like the kind you can get at pretty much any weapon shop (At least in the US). At the cost of slightly shorter range, it has an attack power of almost twice what you would probably have at that point in the game, and you can attack with it much more rapidly than with most of the other weapons. It stays a viable weapon well into the inverted castle. Also the jewel knuckles, which you can pick up early in the game with the aid of a hidden elevator. The Holy Sword is also really good, because of its decent power and more importantly the holy elemental which so many enemies are owned by. Many people overlook the Holy Rod. It is found fairly early in the first castle, does Holy-Type damage that most monsters in the evil castle are weak to, but it also does blunt damage that most skeletons are weak against. Only a handful of enemies are strong against blunt. Also, the rod itself has a small area of effect around the rod tip itself, especially if you do a turn attack, which makes sure that you will almost always hit your target, which is a lot more forgiving than most swords tend to be. It is a very nice weapon until/unless you get the Sword of Dawn, Terminus Est, Crissaegrim, or perhaps Alucard's sword back. Not to mention, Richter is immune to it, and it is very easy to hit Shaft's sphere with it, so you don't have to worry about accidentally killing Richter, or wounding him, causing him to Turn Red. Does This Remind You of Anything? : The end of the Succubus fight, at least in the original version. The Dracula X Chronicles port made her final cry sound a lot more like a death cry. Double Jump: Thanks to the Leap Stone. Dramatic Shattering: After Dracula asks himself about a nature of a man and before answering his own question, he throws the glass dramatically on the floor. Dream Weaver: The circumstances of the Succubus fight. Dual Boss: Three of them. Slogra and Gaibon from Super Castlevania IV team up early, and Werewolf and Minotaur from Rondo of Blood try it again later. And then there's the Dracula's Curse impersonators, which up the ante into a TRIO Boss. Dummied Out: In the PS1 version, a glitch allows you to drop into a normally-inaccessible area that in the Saturn port serves as the entrance to a Saturn-exclusive area. There's even a save point down there. Richter once had a taunt, a low kick, and a spinning kick that was eventually brought back. Easter Egg: Try returning to the room where Death stole Alucard's equipment right after you enter the first room of the Alchemy Laboratory. You will meet Slogra and Gaibon. There are many other little secrets as well. Eldritch Abomination: Alucard specifically says the castle is a creature of chaos and may take many forms. There's also some of the bosses, like Granfaloon (Legion). Eldritch Location: The inverted castle which turns the laws of physics on it's head. There's a reason why all the outdoor levels have ceilings to walk on. Embedded Precursor: The opening of the game is a reproduction of the final boss fight from Rondo of Blood. Jack can't lose it. The Muramasa becomes stronger as Alucard absorbs blood from his enemies. It takes a lot of time, but its attack power can reach the 999 value. The Sword Familiar levels up as Alucard kills enemies. At level 50, it will change form and lets Alucard wield it. On level 70, it changes its attack pattern, and at 90-99, it starts glowing and is able to do the Sword Brothers spell on its own. While not a weapon, the Walk Armor's defense power increases as you explore more map regions. Fake Ultimate Mook: Wargs look menacing, but die in a single hit just like other early-game enemies. Fire, Ice, Lightning: Three Brands, sold by the Librarian or found elsewhere. Frothy Mugs of Water: In the Royal Chapel you can go to the Confession Room and sit at a chair, and at one time a blue-robed ghostly figure will hear your confession and give you... sparkling grape juice! Grape juice in a confession booth? That may have been the result of the drink being modified from wine in the Japanese version. Hmmm... Does This Remind You of Anything? Also, the Green Tea was originally sake, and the Barley Tea was beer. Gravity Screw: The Inverted Castle. Game Breaking Bug: By using the Sword Brothers spell in a save room to enable them to open the menu mid-save and rapidly change their equipment around, the player is able to completely screw up the game's save file. Depending on your timing, you might end up screwing up your map and end up with random squares explored and unexplored, respawning items you find lying around and thus being able to collect them twice, or just corrupt your save. Golden Ending: If you clear the game after exploring more than 195% of the Castles. Good Bad Translation: The original translation appears to have been done by a mildly concussed Lord of the Rings fan with a very tenuous grasp of the English language. Guide Dang It: Getting to the second castle (thanks to an inexcusably misleading clue) or obtaining the beryl circlet. Have a Nice Death: "Let us go out this evening for pleasure. The night is still young." Heroic Albino: Some say Alucard is responsible for the recent surge. High-Pressure Blood: The aptly named blood zombies. Holy Hand Grenade: The holy water, holy sword, holy rod, and holy ash. In the Dracula X Chronicles version of the opening, Dracula refers to Richter as "Belmont, son of Belmont". He has another line in Castlevania: The Adventure Rebirth: "As ever, the ally of worthless humans." This implies that he really doesn't care which Belmont it is; they're all interchangeable to him, making his Dracula X Chronicles line make a bit more sense. I Hate You, Vampire Dad: A literal vampire dad. The reason Alucard changed his name from Adrian was to spite his father. Playtime's over! GRANT... ME... POWERRRR! Being able to attack while moving. Doing 4 slashes in quick succession. Sweeps a large arc in front of you, unlike other swords which only execute a narrow and miss-prone "stabbing" attack. Being able to attack as fast as you can press the button, with little lag. Once you get it, you can pretty much button mash through most enemies. Especially if you equip two. The Shield Rod (or Mablung Sword). Use it and a shield at the same time and you will gain various buffs. With the Alucard Shield, you can shield bash enemies for a ludicrous amount of damage while healing yourself and turning invincible. You can literally walk through any boss if his weak point is exposed. The Ring of Varda, a very powerful stat-boosting ring that won't drop unless your memory card has a completed save on it. Informed Equipment: Played straight with most equipment that isn't a weapon or shield (which appear when you use them), but averted with capes, which actually change the color of the cape on Alucard's sprite, and the Secret Boots, which make his sprite a bit taller. In-Universe Game Clock: The game clock in the menu and the Marble Gallery is actually a 24-hour clock; the game starts at midnight and continues from there. Relevant in that the status buffs of the Moonstone and Sunstone are affected by the time on the clock. In the Saturn version, the current time is instead taken from its system clock, since it has one while the PS 1 doesn't. Joke Item: The Alucart equipment, not to be confused with the Alucard equipment. Even the shield has the "honor" of being the only shield in the game to have absolutely no effect when equipped with the Shield Rod. A complete set of Alucart equipment does have a use: it dramatically increases your LCK. It's still not enough to make it qualify as a Lethal Joke Item, though. There's also Tyrfing, a cursed sword that passes through enemies and does no damage due to reducing your attack to 0 unless you equip enough stat-boosting items and level up enough to compensate for it, and the Saturn version has Sain Iris Shitajiki, a useless, goofy picture of Alucard, which the game (for some reason) treats as a medicine. Kamehamehadoken: The Fist Of Tulkas, a rare drop weapon in the Reverse Library, has two special moves, one a flurry of blows that is activated by a fighting game type combo. The other is a blue fireball that is utilized the same way as entering a Hadoken. Large Ham: Dracula in every version of the game. Last Lousy Point: Many hard-to-reach map squares frustrate completionists, particularly some of the water areas in the Inverted Castle. The secret: Swim up to them using the wolf form. Alucard gets a Luck boost when he wears all Alucart equipment at once -- this effect is often used to up the chances of obtaining the rarely-dropped Crissaegrim. Also, the "effect" of the Alucart Shield is a nod to the Key Sub Weapon from Rondo, which was the strongest, yet almost useless subweapon from that game. The Cat's-Eye Circlet, which protects you from... cat damage. Even so, it comes in surprisingly handy in one of the game's hardest areas. The Red Rust, a two-handed sword which deals less damage than the first shortsword you pick up at the same time that randomly causes Alucard to freeze in place when he tries to swing it but which can be invaluable against both Doppelganger bosses since it curses them on hit, basically making them helpless and unable to attack. Using the Alucart equipment while playing in Luck Mode (gives 99 Luck but sets all other stats to 1 or 0, with 35 HP and 5 MP - far below usual starting stats) will allow him to attack extremely fast and do crit damage high enough to kill many bosses in a few hits. Load-Bearing Boss: Dracula, as usual. A Load of Bull: Minotaur is a Dual Boss with Werewolf in the Colosseum, then reappears as a Degraded Boss in the inverted castle. Lost Forever: The bestiary entry for the Mudman, if you kill the Lesser Demon (boss) without waiting for him to summon a Mudman; and Jack's entry, if you save him without hitting him at least once. Magikarp Power: Familiars are, at first, completely useless and watch idly as you get smacked around by monsters. However, if you suffer them long enough, they will eventually level up and become able to kill most enemies before you can (this is especially true of the Sword familiar which you can even wield as a weapon once its level gets high enough). The Man Behind the Man: Richter struts around the castle and makes himself look like the Big Bad until it's revealed that he's being mind controlled by Shaft. Who is, of course, Dracula's puppet. Metal Slime: The Dodo Bird, who will run away as soon as he sees Alucard. He drops the Runesword and the Heart Broach. Metroidvania: The first Castlevania game in this genre, if we don't count the much-less-well-received Simon's Quest. Mind Screw: In the Reverse Catacombs, instead of lava there is molten ice. Not water, molten ice. Mirror Boss: you fight two doppelganger-type bosses, which use your subweapons and abilities. Morphic Resonance: When Alucard transforms (except to mist), he still keeps a number of features, including a sword tied at his waist. The bat form goes one step further, and keeps the color of the currently equipped cloak as the color of its wings. Nostalgia Level: The Clock Tower and Castle Keep areas are pretty much the same as they were in Rondo of Blood, with new graphics and some new rooms. Offscreen Teleportation: Maria does this a lot. Alucard: Your blood... The scent of your blood... YOU'RE A BELMONT! One-Winged Angel: "Behold my true form and DESPAIR!!!!" In the final boss fight, Dracula doesn't even bother with the first form (after all, we already had it at the beginning of the game). Olrox goes from humanoid into some weird green dinosaur thing. He is more dangerous in this form, as you'd expect. Our Fairies Are Different: The faerie familiar. "Previously On...": The prologue, which remakes the final battle of Castlevania: Rondo of Blood. Post End Game Content: The Duplicator Item and various cheats become available in a new game if you have a Clear or Replay save. Secret Character: Richter (and Maria in the PSP version) can be unlocked after beating the game at least once with enough percentage of the map completed, and then starting a new game. In the Saturn version, they are playable from the start. The Power of Love: "You have been doomed ever since you lost the ability to love." Random Drop: Most of the items, perhaps a first for the series. Rare Random Drop: enjoy your grinding if you want the Crissaegrim. Retraux: In the prologue, the HUD looks like Rondo of Blood's. It also appears when you play as Richter or Maria. Shapeshifter Mashup: Scylla, and potentially Dracula in his final form. Schmuck Bait: Putting the game disc in a cd player will play a hidden track that starts with Alucard warning the listener that "cut number one contains computer data, so please do not play it" and notes that he doubts you'll listen to him anyways. CD players at the time of the game's release were already smart enough to skip the data track, so it was safe to take the bait. The joke is that back when CD players weren't smart enough, there was often a REAL audio warning at the start of track 1 explaining not to try to play it back. Showgirl Skirt: The faerie familiar's outfit. Shout-Out: Konami loves having fun in its games, and this one is no exception. Symphony is especially chock full of references to other Konami titles as well as other works. Some item names in the US release are references to The Lord of the Rings. The "Fist of Tulkas", the "Crissaegrim" and the "Ring of Varda", for example. Don't forget the enemies, Lion, Scarecrow, and Tin Man. The Medusa Boss in the Inverted Castle says "I'm petrifying!" when you beat her, to top that reference chain off. The Capsule Monster rare items are from Ultraman. The Gold and Silver Rings as well as the clock face are a reference to The Castle Of Cagliostro. The morphing Black Panthers are a reference to Lodem from Babel II. More people probably remember its cameo in Giant Robo. The Moon Rod is from Sailor Moon. In Kurt Vonnegut's Cat's Cradle, a Granfalloon was a group of people who falsely believed they shared the same identity or purpose, but in fact their association was meaningless. A portrait of Vlad Tepes is a usable item. Olrox is based on Orlok from the film Nosferatu, complete with the movie poster on his door. Trevor Belmont is remembered in NES graphic form, and later as an imitation boss along with Sypha and Grant, the other two partners you could meet besides Alucard in Castlevania III. Galamoth was originally a boss in Kid Dracula. The sword Mourneblade, which heals Alucard everytime he strikes something with it, is a reference to Mournblade, the sister-sword to Elric's runesword Stormbringer, in Michael Moorcock's Elric saga. Stormbringer, as well as Mournblade, stole their victim's souls, strengthening their wielders in the process. 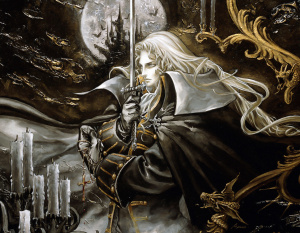 The Sword of the Dawn, a hidden sword with a special ability to summon minions that attack Alucard's foes, is also a reference to Michael Moorcock's work. His character Hawkmoon wielded The Sword of Dawn, a weapon that summoned warriors to aid Hawkmoon. The Shield Rod can create the Shield power ups from Gradius. The bat familiar, when leveled up enough, can summon more bats when you take bat form. These bats move much like Options. Shut Up, Kirk: Dracula's last line in the prologue. Skippable Boss: In the first castle, there's Scylla, Granfalloon, and Karasuman. In the inverted castle, there's Beelzebub, Doppelganger 40, and the Fake Hunters (not counting Bonus Boss Galamoth). Solemn Ending Theme: "I Am the Wind"
Space-Filling Path: Zigzagging corridors, long vertical shafts... generally a case of size for the sake of size. Special Attack: Several weapons have alternate attacks, either activated with back-forward-attack or down-down/forward-forward attack, such as the Shield Rod's powers and the Fist of Tulkas' special moves. Sometimes they're simply more powerful, other times they have interesting or useful side effects. Speed Run: It's quite possible to finish Richter mode in less than ten minutes. After the game is beaten once with Alucard, a Time Attack section appears in his menu, allowing the player to see how long it took them to reach the final save room and clear the game. Spell My Name with an "S": the game can't quite decide between American 's' and British 'c' spellings in some areas, leading to the spelling "Reverse" in some cases. Spikes of Doom: But with the Spike Breaker armor, you can render them harmless by destroying any spikes you touch. This is necessary to complete the entire game. With some glitches, it is possible to skip the spike breaker entirely. Super Drowning Skills: Alucard, being half-vampire and all, until he obtains the Holy . After which, in a series' first, the player character can freely explore water without sustaining any damage. Note that in this particular game water doesn't kill you outright, even if you don't have the symbol - you will take a lot of damage but it's still possible to jump out. One of the lesser used tropes of vampire weaknesses is their inability to cross running water under their own power, which this weakness is a reference to, though the Holy Symbol being a snorkel is a fun sight gag. A Taste of Power: At the beginning of the game, you have a ridiculously powerful suit of armor and a sword that makes short work of every enemy. However, when you run into Death, he uses his magic to make all of it go away. ...unless you deliberately glitch the cutscene to keep your equipment (which is possible on some platforms). This is almost universally considered a Good Bad Bug by the player community. Teleporters and Transporters: Five of them in each castle. You can 'port to the second on finding the first (per castle), but the rest can only be accessed after you've reached them normally. This Cannot Be! : Said by Dracula himself, word for word. Throwing Your Sword Always Works: The Runesword and the Heaven Sword. Time Stands Still: The Stopwatch subweapon. It's oddly selective, though -- some enemies will be frozen, some will merely slow down and some (including most bosses) are entirely unaffected. Trick Boss: In one room in the Underground Caverns, you fight a single snake-like creature. It goes down rather easily. In the next couple of rooms, you realise it is just one of several, all attached to Scylla, the actual boss. Unique Enemy: Absolutely loads. Often more than one of them appear, just that they only ever appear in a single room in the entire game. There's the dodo that runs when you go into the room, the discus lord that only appears in a single room in the Catacombs, the giant blue hammer enemy (his kin appear again, he doesn't), the mudmen only appearing in the Lesser Demon boss fight, the Alura Une, the slimes (particularly the giant one), Yorick... you get the point. Some enemies appear to be this, but then later in the game they become more numerous as you become stronger to deal with them (notably the demon who is accidentally called "Cthulhu"). According to Yahtzee, the philosophy behind the enemy designs seems to be, "Every time you palette swap, A BABY DIES". Victory Is Boring: Jack's reasoning was that he wanted to duel Dracula for all eternity. That's what Shaft told him to say. Violence Is the Only Option: What starts as a theological/philosophical debate in the prologue (this being more prominent in the Japanese version) ends in a fight to the death. Voluntary Shapeshifting: Alucard can turn into a bat, a wolf and mist. The Axe Armor transformation seems to be unexpected, though. Wasted Song: The most notable example is Prologue, only played during the intro stage, which has no enemies aside from Dracula and consists of a walk up a staircase and down a hallway, and when you fight Dracula, his own theme plays. Another example could The Door to the Abyss, arguably the most scary song in the soundtrack, only plays in the centre of the castle which again, features no enemies except for Shaft and Dracula in the inverted castle version (and Maria, on Sega Saturn's first castle) and is extremely short. Weaksauce Weakness: If Alucard can reach the high platform on the wall behind Galamoth quickly enough, he can easily punch him in the face until he dies. Weapon as Familiar: The Sword Familiar, a creature that fights for you that you can equip as a weapon. Woobie, Destroyer of Worlds: Dracula is turned into one by this game, showing he wasn't always evil and even realizes how hopeless his life is. World of Ham: There's maybe one scene in the entire game where the characters aren't taking a bite out of Castlevania. jack is incapable of even thinking to himself without hamming it up. And then, there's Dracula. There's a reason he has a Large Ham entry to himself on this page, even when this is a World of Ham. No, This Cannot Be!! AAAAAAAAAAAAAAAAAAAAAAAAAAAAA!! Impossible! Not this time! AAAAAAAAAAAAAAAAAAAAAAAAAAAAA!! This page was last edited on 17 March 2019, at 21:09.